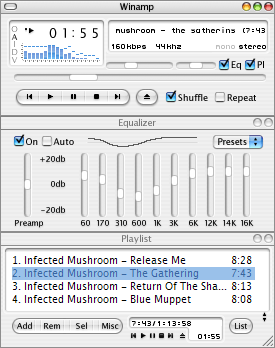 Also, Rhapsodized skin is missing a few elements in the equalizer and the media library. I hope to have all this done by the end of this month. I just got a Mac mini a few days ago, and realized that my current Mac OS X skins for winamp were pretty outdated. Currently, they are based on 10.2 (Jaguar) so I started some work or re-doing them with new graphics from 10.4 (Tiger). I hope to release a new Aqua version sometime next month. 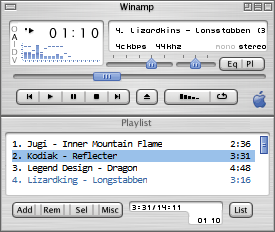 Also, the Rhapsodized winamp skin is almost finished, so that should be posted soon as well. After not having time to do any updates on my web site, I just decided to install a blog software, and post my work using that instead. Previous work that was available on my web site will be transfered here in the coming days months or next year, so please be patient. In the meantime, you can check out my now pretty old Mac OS X skins for Winamp. Note: The date on the skins will be changed to the date the skin was released. After doing my Winamp X skin, I wanted to do one that looked even more like the Mac OS X Aqua style. So I did Mac OS X, it looked a lot closer to the Aqua interface, but still wasn’t like I wanted it to be. After Apple released OS X 10.2 (Jaguar), I started work on this skin, on which I resumed work a few months later. Now, it’s ready to be used, and I hope you like this Graphite version as much as I do. 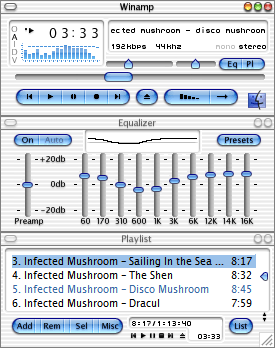 After doing my Winamp X skin, I wanted to do one that looked even more like the Mac OS X Aqua style. So I did Mac OS X, it looked a lot closer to the Aqua interface, but still wasn’t like I wanted it to be. After Apple released OS X 10.2 (Jaguar), I started work on this skin, on which I resumed work a few months later. Now, it’s ready to be used, and I hope you like this Aqua version as much as I do.